Prince Edward County and Haldimand Twp, Northumberland Co. It was hard not to be curious about a Jonathan Clarke, a Quaker, who in 1802 was admonished for "striking his wife" and eventually disowned. Later a Jonathan Clarke was a Quaker minister. Was this the same man? There is a second group of Quakers: Freeman Clark and his son Jonathan Clark among others. Are they all connected? And there are other Clarks as well. This research creates a few Clark family groupings in the Quinte area. Thanks to Carm Foster, Lorna Laughton, Ted Dinniwell, Gerry Dobson, Gord Thompson and Janet Kellough for their valued interest and assistance. Information is welcomed from other researchers. Quakers: Jonathan and Sarah Clark of Hallowell Tp. Quakers: Freeman and Lydia Clark of Haldimand Tp. Quaker: William Clark of Hallowell Tp. This research started with trying to connect Jonathan Clark, who in 1802 is reported in the Quaker minutes to have "abused" his wife, with Thomas Clark and others in the Quaker minutes. Carm Foster very quickly was able to find Lorna Laughton a descendant of the above Jonathan and also to connect with Ted Dinniwell who is a descendant of a different branch of Clark Quakers that were all under the West Lake Monthly meeting. Lorna and Ted's work was extremely helpful in making sense of what was in the record. Sections 2 and 3 below focus on the Quaker families that we have come to know a fair bit about. Section 4 presents information on Loyalists who settled in Adolphustown and are quite separate from the Quaker families. And section 5 brings to light a 1792 petition for a group of Vermonters who indicated their interest to settle in Haldimand Township. Clark or Clarke is a common name and there are many settlers of that name spread across Upper Canada. This web page identifies a few Clark groupings in the Quinte area that might help researchers find connections. More information is always welcome. A few words are necessary about the Quaker books that are filled with detail. First is the Register (section 7) which was begun by the orthodox Quakers for the West Lake meeting in 1824 just before the separation in 1828. Quakers split into two groups; the orthodox who were able to keep the meeting house in Bloomfield and the Hicksite followers who had to build a new meeting house and burial ground in Bloomfield. This separation occurred throughout North America. Second are the minute books of monthly meetings. Haldimand, Ameliasburgh and Adolphustown were subordinate Preparative meetings to West Lake in Bloomfield at the time of the separation. West Lake was the home of the superior Monthly Meeting and Preparative meetings sent representatives to these meetings each month to conduct business. These records provide an amazing amount of detail. In section 8, Clark references in the various Quaker minute books are presented for easier reading. Links to the transcriptions are provided and readers are encouraged to examine the whole book for each meeting. Quakers are also called Friends, an abbreviation of their formal name: The Society of Friends. For further information visit the web site of the active Canadian Friends Historical Association, CFHA. There is a great deal of information there and they would appreciate your support with a membership. This Jonathan Clark was born in Rhode Island and moved with his parents to Dutchess County, NY and he and his wife came to Upper Canada about 1798. He first settled in Adolphustown, then within a year probably moved to Hallowell as a tenant before buying a farm in Ameliasburg in 1807. Jonathan and Sarah were Quakers and he was instrumental in establishing the Ameliasburgh Meeting in 1814. In 1822 they bought a farm at the western edge of Bloomfield, Hallowell Township, and settled there. Jonathan was twice appointed to be a Quaker minister and disowned 4 times, the last in 1838. He was a miller and started the mill on his lot in Bloomfield. After Sarah died he married a second time to Mehitable, surname unknown. He died in 1856 from a horse and wagon accident having had two daughters and five sons: Susannah, Ruth, William, Philip, Allen, Jacob and Timothy. Who are the parents of Jonathan Clark? The 1851 census for Hallowell, Prince Edward County shows Jonathan Clark, gentleman, age 75 as being born in Rhode Island. This all fits very well. The above family matches the Jonathan in a Nine Partners minute book entry of 11mo, 1779. "At this meeting was accepted a cartificate of removal for Jonathan Clark and his wife Susannah and children Viz. Lydia, Philip, Elizabeth, Jonathan & Ruth. From the monthly meeting at Coackset [Acoaxet in Westport, MA] where he came from to reside for a time." The will of Jonathan Clark senior, of Lagrange, NY was dated 1 April 1831 and probated 30 July 1832. It reads,"I Jonathan Clark of the town of Lagrange, Dutchess County, ... last will and testament ...bequeath to the children of my son Philip deceased, as follows: Jonathan P Clark $30, William Clark $330, David Clark $330, Elizabeth Frost $200, Abigail Clark $200 ... I bequeath to the children of my daughter Ruth Moore as follows: Stephen Moore Junr, Alfred Moore, Anna Maria Congden, Philip Moore, Elizabeth Thorn, William Moore, Contend? W Moore each $10 and to Susan C Moore, Lydia Moore, Ruth Moore $20 and to Jonathan C Moore $25. ... I bequeath to the grandchildren of my daughter Lydia Carpenter deceased viz the children of Leno Carpenter as follows: David Carpenter, Sarah Ann Carpenter, Richard Carpenter, Phebe Carpenter each $20. ... I bequeath to my son Allen Clark $1000 ... bequeath to my daughter Ruth Moore $1600 ... including the note against Seburn Dorland more than 6 years standing ... the note against my son Jonathan Clark Junr shall not be collected and that my executors cancel it or deliver it to him & that he shall receive nothing further from my estate he having received his full share ... appoint son in law Stephen Moore, grandson William Clark and esteemed friend Henry Brost? to be executors ... "
Source: NY Probate Records 1629-1971, Dutchess County, Wills, Vol I-J, 1831-1837, 202, image 136 at Familysearch.org, thanks to Ted Dinniwell for finding this will. The sibling Lydia married a Zeno Carpenter in 1786. They are named in an index to Creek MM in Dutchess Co., page 15." This matches the information by Doherty and the will. Note the repeated use of forenames in the two generations which speaks loudly of a connection. The will does not state that the son Jonathan lives in Upper Canada. However it is concluded that this Jonathan Clark of Hallowell is the son of Jonathan Clark of Lagrange NY whose will is above and names his son Jonathan. What is the first reference to Jonathan in Upper Canada? The Adolphustown Census has survived for the years 1794 to 1822. The Clark entries for these years are shown below. Note that a Jonathan Clark with wife and a daughter was listed in 1799. This most likely is this family including their daughter Susannah. At this very early date there was no other Jonathan Clark in the vicinity. The next reference was on 27 8mo 1800 in the Adolphustown Minute book where "an acknowledgment from Jonathan Clark" is mentioned. Acknowledgments were written apologies for past transgressions and asked for acceptance to return to being a Quaker in good standing. A committee was always appointed to meet with the person and make a recommendation. The contents of this acknowledgment were not described. After months of short reports, finally on 5mo 1801, Jonathan's acknowledgment was accepted. During this period, on 1mo 1801, "The Preparative meeting informed this that the monthly meeting in Ninepartners had informed that meeting that Allen Clark had Deviated from plainness been concerned in making a horse race and attended a training and they requesting our care therein therefore John Dorland, Philip Dorland and Jacob Cronk are appointed." This means that the Preparative meeting informed Adolphustown Monthly Meeting that it had heard from Nine partners Meeting in Dutchess County, NY, that Allen Clark had deviated from the Quaker discipline. It suggests that Allen was in Upper Canada with his brother Jonathan. Attempts to meet with Allen continue till 5mo 1801 then cease suggesting he returned to NY. This is the only record of Allen in Upper Canada. In the Adolphustown minutes of 5 mo 1802 it was recorded, "Said meeting also inform that Jonathan Clark had given way to Passion so far as to misuse and abuse his wife which they refer to this meetings consideration." A committee was struck and visits made and on 9mo 1802 his acknowledgment was accepted. Then a year later, on 9mo 1803, the minutes tell a damning story. "The friends appointed to inform Jonathan Clark of this meetings concusition to disown him Report the appointment answered and produced a few lines for that purpose ? follows which being read in are approved and signed whereby he stands disowned. .... Whereas Jonathan Clark a member of this meeting has so far given way to passion as to use unbecoming words and strike his wife and the repeated labour of this meeting to bring him to sence of his error not having the desired affect Therefore We do Testafy against his said misconduct and disown him to be any longer a member with us untill by amendment of life he shall make satisfaction to this meeting Which that he may be favored to do is our Desire." Sarah Clark was accepted as a member on 2mo 1805. Over a year later Jonathan Clark submits an acknowledgment and after a number of visits he was accepted six months later. Jonathan was not mentioned in the minutes again till 1813. This is a remarkable story. Quaker women were held as equals to men and abusing your wife was not accepted. Quakers were ahead of their time in so many ways. 1807 Jonathan and Sarah in Ameliasburgh. In 1807 Jonathan Clark "of Hallowell" buys lot 11, First Concession Lake Side which was in Ameliasburg at the time and became Hillier Township in 1824. They buy it from Philip Dorland, a fellow Quaker. The farm was just west of Wellington village - see the map below. The fact that Jonathan is said to be of Hallowell suggests he was living in Hallowell and perhaps renting a farm somewhere from 1799 till 1807. In 1820, Jonathan buys a further 61 acres of lot 11 and he is said to be from the Township of Ameliasburg. Also in 1820, Jonathan sells the North half of the lot to Henry McDonald. In 1832, Jonathan sells the South half of the lot to his son in law, Jonathan I Bowerman. This matches with the advertisement in Dec 1831 to sell his farm and mill. See below. This sequence of events for the lot is from the Hillier Abstract book [AO, GSU 198162]. Sarah's name is not mentioned in any of the land records. It appears justified to conclude that lot 11 in Ameliasburgh/Hillier was the principle residence of Jonathan and Sarah Clark after 1807 until they purchase lot 7 near Bloomfield in 1822. Perhaps after 1822 Jonathan had his daughter Susannah and son in law Jonathan Bowerman (who were married about 1820) take over the farm in Hillier and eventually buy him out in 1832. There is a court case in 1807 where Mary Cole, wife of Daniel Cole, "was barred of her dower of lot number 15 of the first concession of Hallowell. Sold to Jonathon Clark." An investigation of the land records of Hallowell and Hillier for a lot 15 in the first concessions shows no sale from Cole to Jonathan Clark. Perhaps Jonathan flipped this right to sell the lot to someone else. Ted Dinniwell located a book On the Edge of History, Dorland's Creek and the Mills, by E.D. Taylor Ashton, 1996. In it Ashton relates that "Jonathan Clark, a Quaker friend of the Dorlands, moved to lot 25, [Con 3 Lake Side, Hillier Township] in 1812 and sold the lot 6 years later. It is possible that Jonathan Clark worked at building the mill as he moved on to Bloomfield in 1818 and built the Clark Mills." This lot was in Hillier and next to a mill site on lot 24. Jonathan bought it from James Latham and sold it to James Palmer. There is no evidence to support the idea that Jonathan was involved in the mill on lot 24 other than Jonathan became a miller and in this case owned the adjacent lot. Jonathan bought his land in Bloomfield in 1822, not 1818 as Ashton states. Also it is hard to know if Jonathan lived on lot 25 or lot 11 in what was Ameliasburg at the time. Below it will be shown that Quaker meetings started at Benjamin Garrett's home in 1814 and Garrett bought lot 13 in 1813. Interestingly lot 13 was also a mill site - see the map above. The Quaker meetings then were held at Jonathan Clark's home which was probably two lots east at lot 11. Based on this thinking, it is concluded that Jonathan and his family lived on lot 11. In the women's Adolphustown book, on 3mo 1814, Jonathan and Sarah have their three children; Susannah, Timothy and Philip, accepted as members. In the next month, 4mo 1814, Jonathan requests a meeting be established "at or near Benjamin Garrets" and a committee is formed to consider the matter. Then on 12mo 1815 we have this entry. "The time expired the meeting was allowd friends at Benjamin Garrets and a Committee report they have attended it and saw nothing but that it was orderly held and also that think best it be moved to house belonging to Jonathan Clarke and the mens meeting informs they unite with them therein." When coupled with the fact that Sarah Clark is very active in the minutes and no other Clarks are named, it is concluded that Jonathan and Sarah are the same couple as described above. This meeting held at Garret's and later at Jonathan Clark's became the Ameliasburgh Preparative Meeting in Wellington located a few miles west of Bloomfield and was recognized by Adolphustown in 1817. Arthur Dorland in his book A History of the Society of Friends (Quakers) in Canada, 1927, page 86, relates the development of this meeting and mentions the meeting being held at Jonathan Clark's in the early days. He states that Ameliasburg Prep was later called Hillier Prep. This makes sense because Hillier Township was created in 1824 from the part of Ameliasburg Township west of Wellington. On 11mo 1816, in a West Lake Prep book, Jonathan is named on a committee with others to superintend the school. In 1822, Jonathan Clark "of Ameliasburg" purchased lot 7, 2 Concession Military Tract, Hallowell. This lot later is just west of the main part of Bloomfield. Jonathan bought the lot from Jonathan Bowerman the second for £1050. The fact that he is said to be from Ameliasburg supports the idea that he was living on the farm that he bought in 1807. In 1824, that part of Ameliasburg became Hillier Township. In 1832, Jonathan Clark sold the south half of lot 11 in Hillier to his son in law, Jonathan I Bowerman. He had already sold the north half in 1820 to Henry McDonald. Therefore by 1832 Jonathan had given up his interest in the Hillier lot. In the women's Adolphustown minute book, 5mo 1817, Jonathan is made a minister. On 8mo 1824 he "is released from the station of minister." The same event is more elaborately noted on 7mo 1824 in a West Lake Hicksite book, "The Preparative Meeting of Ministers and Elders held 11th of 7th Month 1824 informed this Meeting that the Labours of Jonathan Clark as a Minister are become useless, and after consideration therein, this Meeting is united that he is disquallifyed for that station" and further, "Came to this from [West] Lake Preparative a complaint against Jonathan Clark which is as follows, Jonathon Clark having so far Deviated from that which would have perseaved him as to partake of Spiritous liquors to excess, and using profane language in his family." He was disowned the following month. Sarah Clark remains active during this period. In a West Lake Preparative minute book Sarah is on many committees from 1809 to 1816 and not again till 1822. A Sarah Clark appears frequently in the Ameliasburgh Prep Women minutes from 1817 to 1819 on various committees and eight times is appointed to attend the Monthly meeting at West Lake. It is concluded that this is the same woman. On 11mo 1821 a complaint against their daughter Susan Bowerman "formerly Clark" is recorded with no details in following meetings. In 1828 the Quaker society separates into two. One called the Hicksites who follow the thinking of Elias Hicks and the second called Orthodox. The Orthodox end up with the West Lake meeting house and burial ground. The Hicksites build a new meeting house in Bloomfield and establish a new burial ground. It is a difficult split. In the West Lake minutes that ended up in the Hicksite hands, Sarah Clark is disowned on 4mo 1830. This means that she remained Orthodox. In the West Lake book that remained in Orthodox hands, on 3mo 1830, Jonathan Clark sends an acknowledgment "condemning his outgoings and deviations." Jonathan is accepted back in 6mo 1830. On the very next line in this Orthodox minute book is this entry. "Jonathan Clarke, now disowned, was a former trustee of the Haldimand Meeting and a committee is formed to secure the title and deed of Haldimand Meeting house and ground. Freeman Clarke is named as a successor trustee." How do we make sense of this? The next section details the Freeman Clark family of Haldimand Township near Grafton, Ontario. The Jonathan Clark named above and "now disowned" is the son of Freeman Clark since he became Hicksite. His father, Freeman Clark remains Orthodox and takes over his son's roll as Trustee. There are two men named Jonathan Clark; one from "Hallowell" and b. 1775 who becomes Orthodox and one from Haldimand Township b. 1802 who becomes Hicksite. There is a small potentially confusing entry in the Haldimand Preparative book that was in Hicksite hands. For several months in a row from 2mo to 12mo 1831, the meeting each month was harassed by Orthodox supporters and the names of the harassers are recorded in the minutes for each month. On 6mo 1831, "Jonathan Clark of Hallowell" is named as one of the harassers. The other Jonathan Clark named frequently in these minutes is the son of Freeman who was Hicksite. In 1831 Jonathan Clark of Hallowell was back in good standing and decided on this one occasion to go 50 miles to Grafton to disturb the meeting with some others from the West Lake Orthodox meeting. The West Lake Orthodox minutes next mentions Jonathan when he is once again, made a minister on 6mo 1833. "The committee appoints to hear and consider objections if any to Johnathan Clark and Thos Robinson being acknowledged ministers inform they have paid attention thereto and do not find any thing but they may be acknowledged such after deliberation the meeting appears united in their being acknowledged having the unity of the women. The clerk directed to furnish the preparative meeting of ministers and Elders with a coppy of this minute." In this same West Lake Orthodox minute book Jonathan Clark shows up again on 1mo 1838 to attend the Half Yearly Meeting. This would have to be the Jonathan Clark of Hallowell because the Jonathan Clark of Haldimand died in 1835. But then Jonathan's old ways surface again. On 7mo 1838, of the same book, it is recorded that, "Three of the Committee appointed to labour with Jonathan Clark report further attention and find that part of the complaint Just that relates to abuse of 3 friends in word and disunity with another friend and that he does not appear disposed to make friends satisfaction after weightily considering the matter the meeting unites in the conclusion to disown him." No mention of Jonathan Clark has been found in the minute books after this time. Jonathan Clark and the "Clark Mills"
In the Settler's Dream, researched by Tom Cruickshank and edited by John Stokes, 1984, it is stated with regards to Bloomfield, "the presence of no less than four mills - Clark's, White's (later Noxon's), Bull's and Bowerman's - all of which harnessed water power from the creeks that feed West Lake." ... "The four mills were located among the farmhouses fronting the Danforth Road (Hwy #33) ..." The book has an early postcard photo of Clark's Mill stating that after the sale in 1847 the mill has remained in the Cooper family until the present day. Thanks to Janet Kellough for finding this reference. 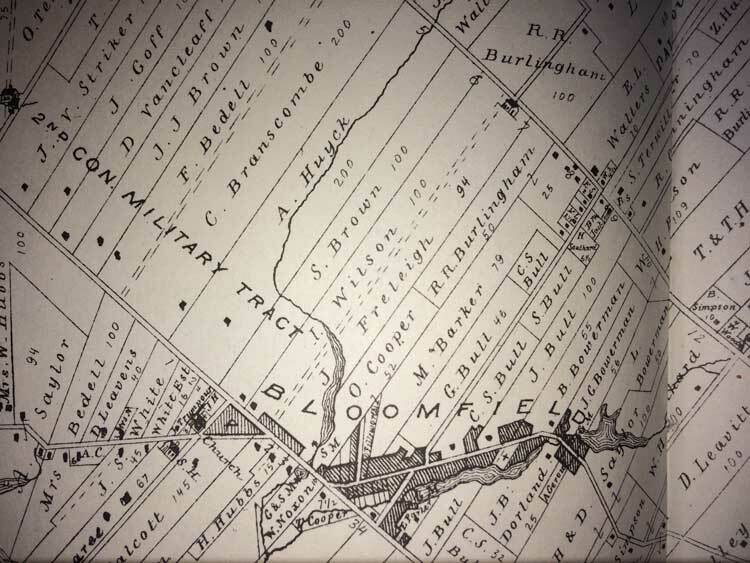 Recall that in 1822, Jonathan Clark bought the whole 200 acres of lot 7 shown on the Belden 1878 map below. Note the mill pond and the symbol "SM" standing for saw mill at the head of the mill pond. Note that across the road on Noxon's property there is a smaller mill pond and the symbol for grist and saw mill. Also, another grist mill is at the end of the mill pond south of the town. Indeed, Bloomfield was a mill town. Google maps of Bloomfield show that the mill pond on lot 7 still exists. 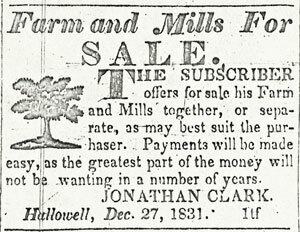 Direct evidence of Jonathan's involvement with mills are these 1831 and 1834 advertisements, below, in the Hallowell Free Press to sell his farm and mill. We know that Jonathan Clark kept the south half family farm of lot 11 in Hillier until 1832 and but probably spent most of his energy being a miller in Bloomfield and lived there. 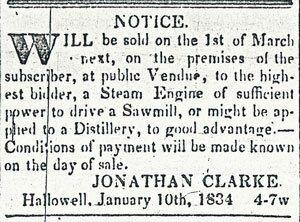 Note that he used the plural "mills" for sale so he owned more than one mill. Source: Hallowell Free Press, image supplied by Lorna Laughton, AO, N60, reels 1 and 2. Clearly Jonathan was a miller though described as a yeoman in the deeds. Mills powered by dammed streams were seasonal and perhaps being a yeoman was the most important job. What is in question is when he started his own mill. Perhaps it is true that he helped build the mill on lot 24 in Ameliasburg and perhaps even helped Garrett start a mill on lot 13. Maybe when he purchased lot 7 in Hallowell in 1822 the mill was already developed to some degree. Maybe he rented the site before purchasing the lot. More information from other researchers is welcome. William G Clark sells 48 acres of his holdings on lot 7 to Obidiah Cooper in 1847 and this is shown on the 1878 map above. This does not involve the mill. Jonathan's will in 1856 names his second wife as Mehitable. His first wife, Sarah died in 1844 so he probably married Mehitable not long after. No record of the marriage has yet been found. She is also named as his wife in the 1851 census. The cemetery transcription shows Jonathan Clarke, buried in the Wellington Cemetery, old part, "died 12 Oct 1856, aged 80 yrs 10 mo 15 days", giving a birth date of 27 Nov 1775. His wife Sarah is buried next to Jonathan, "Sarah Clark (wife of Jonathan Clark) died 04/11/1844 (April 11, 1844) aged 62 years 11 months 12 days" giving a birth date of 30 April 1781. They are buried in the old section of Wellington Cemetery row 19 stone 16a and b, grave 1. Susannah Clark is named as their child in the Adolphustown Women's minutes on 3mo 1814. Susannah Clark is not named in her father's will probably because she predeceased her father on 6 Sept 1855. Lorna Laughton descends from Susan (Susanna) Clarke. She married Jonathan I. Bowerman around 1820 and they had 9 children in Hillier Township, Prince Edward County. On 11mo 1821 a complaint against their daughter Susan Bowerman "formerly Clark" is recorded with no details in following meetings. Jonathan I Bowerman buys Lot 11, Con 1, Lakeside, Hiller from Jonathan Clark in 1832. Philip Clark is named as their child in the Adolphustown Women's minutes on 3mo 1814 and also in the Quaker Register. Philip Clark is named in his father's will. Philip married Ella Dorland Farley. Lorna adds that her grandmother, Pearl Trumpour, informed her that Susan and Philip were both children of Jonathan and Sarah Clark. The Philip in the Quaker minutes marries a woman named Sarah. On 2mo 1828, in a West Lake Prep book and also the Monthly Meeting book. "A complaint against Phillip Clarke for going out Plainness in dress attending a marriage acc. by a priest and suffering himself to be joined in Marriage by a priest to one not a member which is directed to the Monthly Meeting." Philip is accepted back as an orthodox Quaker by an acknowledgment in 1837. The above Monthly Meeting book ended up in Hicksite hands and in 11mo 1828, Philip is disowned for separating which means he stayed Orthodox. Who is the Sarah Clark that married Philip Clark? It is interesting that Jonathan I Bowerman, husband of Susannah (Susan) Clark, daughter of Jonathan and Sarah, buys the northern parts of lots 10 and lot 11 from the estate of Henry McDonald. Henry's will (below) is written in 1850 and probated in 1858 and he names one of his daughters as Sarah Clark. Jonathan Clark owned the whole of lot 11 and sold the north half to Henry McDonald in 1820. Thus the Clarks and McDonalds were neighbours and Philip Cark and Sarah McDonald were children of their respective families. It is concluded here that Sarah (McDonald) Clark is most likely the wife of Philip Clark as we see from the Quaker register that he married a Sarah. We also see that they married in 1828 and Philip was disowned for marrying out. Henry McDonald was not a Quaker. Philip made an acknowledgment and was accepted back in 1837. Timothy Clark is named as their child in the Adolphustown Women's minutes on 3mo 1814. Timothy Clark is named in his father's will. Gerald Dobson is a descendant and writes that Timothy was born in Bloomfield, UC on May 2, 1806 and died Feb 28, 1870 in Huntingdon Twp., Hastings County, Ontario. He married Margaret Phoebe Murdoff. Timothy Clark is admonished in the West Lake minutes in the same meeting that Philip Clark is admonished. On 1mo 1828 is this; "A Similar Complaint against Timothy Clark for going out of plainness in dress, neglecting the attendance of Meetings and attending a marriage accomplished by a Priest." Gerald found an old, small, Quaker cook book that was his great grandmother’s (Timothy’s daughter). William Clark is named in his father's will. William G Clark buys part of lot 7 in Hallowell in 1839 from Jonathan Clark, no relationship stated. It is assumed this William is the son of Jonathan. Deeds rarely state relationships. He sells the land in 1847. There is a William G. Clark who buys half of lot 16, First Concession of North West of West Lake, Hallowell in 1849. Allen Clark is named in his father's will. Jacob Clark is named in his father's will. The West Lake Register mentioned above, records that Jacob was considered insane and in the Toronto Asylum and that he was deceased. Ruth Clark is named in her father's will. Gerald Dobson thinks she married David Conger. The Quaker Register has this entry: "Clark Jonathan, Hallowell, Disowned killed by wagon and horse ran again[st] him, 10th mo 12th 1856." Jonathan writes his will on 1 Sept 1856. It is very possible that the will was written after wagon accident occurred and the injuries appeared serious. He died 6 weeks later. Below is his informative will. It is interesting to read one of his wishes, "It is my wish that my body be be laid in Thomas Stinson's burying ground with a large ornamented stone engraved on it Jonathan Clark Minister of the Gospel of Jesus Christ Died etc." He is not buried in Stinson's Cemetery, instead in Wellington, the old part, perhaps that was the Quaker burial ground. This needs to be investigated. Jonathan was a disowned Quaker after 1837 but there are other examples of non Quaker members being buried in Quaker grounds. In fact, disowned Quakers could attend religious meetings but could not partake in the monthly meetings and the business of the Society. Some of Jonathan's children may have continued as Quakers into the 1850's. Quarter Sessions at Adolphustown, 27th January 1807, Mary Cole, wife of Daniel Cole, was barred of her dower of lot number 15 of the first concession of Hallowell. Sold to Jonathon Clark. Source: Minutes of the Court of Quarter Sessions of the Peace for the Mecklenburg District, Vol 1, p. 146. Linda Corupe. Thanks to Ted Dinniwell for passing this on. 8 Mar 1820, bargain and sale from Thomas McCartney and Mary his wife to Jonathan Clark, both of the township of Ameliasburg, for £50 sells lot 11 Con 1 Lake Side, Ameliasburg, 61 acres. Witnesses Samuel Hewe? and Philip Clark. Registered 7 Mar 1822. March 1837, Jonathan Clark of Hallowell prays to buy lot 65, 2 Con, Green Point, Sophiasburgh, a Clergy Reserve. Was leased to Henry Gerow, rents not paid. Recommended to be sold to the petitioner. Ted Dinniwell writes that "Freeman Clark was born 30 Jan 1773, probably a son of William Clarke and Jemima Clark (Clerk). William and Jemima Clerk and family Freeman, Martha, Arnold, Jeremiah, Urania, John, Ruth, Presson and Mary moved from Oblong Monthly Meeting, Dutchess County, NY to Saratoga Monthly Meeting 1-12-1795. There were no births registered for Clark children in the Oblong Register 1757 - 1783. Freeman died in Haldimand Twp, Northumberland County, Upper Canada on 22 Apr 1835." Lydia Ferris was born 5 Mar 1777 and died Oct 1870. Freeman and Lydia Clark lived in Haldimand Twp., Northumberland County. He was a blacksmith. They were Quakers. The Haldimand Preparative Meeting was formed in 1827 meeting at the home of Freeman and Lydia Clark. A meeting house and burial ground was established on a piece of their farm. They had 10 children. Lydia's surname, Ferris, comes from an on line genealogy and has not been confirmed by contemporary records. See the 1997 posting titled Clarke, Herbert Stanley on Genuki L archives. Freeman and Lydia Clark can be traced to the Quaker meetings in NY State. Freeman was disowned in the 3rd month of 1805 for not paying his debts and "absconding." He absconded to Upper Canada! In the Quaker separation of 1828 two of their sons became Hicksite and took control of the Haldimand Meeting. Freeman and his wife Lydia and most of their children remained Orthodox Quakers. Who are the parents of Freeman Clark? Quaker minutes from NY State record this family with their children including a son named Freeman. 12 10mo 1789, William and Jemime Clerk by way of Poughquague Preparative Meeting [in Town of Beekman] requests children Arnold, Jeremiah, John, Martha, Urane, also Freemon another of their sons to become members. The record that links this above family is this will of Benedict A[rnold] Clark. Benedict's siblings are the same as named above. The children listed for Freeman Clark are the same as the children for Freeman Clark in Haldimand Township including Polena's husband. Sibling Martha married Stephen West. It has not been confirmed, but it is assumed that Benedict Arnold is in fact the Arnold in the above Quaker record. It is concluded that Freeman Clark of Haldimand is the son of William and Jemima Clark of Saratoga Co., NY. Source: NY Probate Records, 1629-1971, Saratoga Co., Vol 15, page 310, on line at FamilySearch.org, image 444, Thanks to Ted Dinniwell for finding this will. There are 3 burials from the above. In 1789 Freeman is living with his parents in Dutchess County, NY. In 1794 and 1795 the family are mentioned again in the NY Quaker minutes. In 1796, Freeman is disowned, possibly for marrying out but no reason is given. In 1801 Freeman is reinstated to membership and Lydia requests membership indicating she was not a Quaker before marriage. This supports the idea that the disownment in 1796 was for marrying out. Then in 1805, Freeman is disowned for not paying his debts. 8mo 1794, Through Poguage Preparative Meeting Wm Clerk hath a prospect of selling his farm and moving. 1 12 1795, William, Jemina, ch: Freeman, Martha, Arnold, Jeremiah, Urania, John, Ruth, Presson, Mary. Certificate to Saratoga [SaratogaWest] for all. Freeman and Martha free of marriage engagements. 24 2mo 1796, Freeman Clark disowned. 19 4mo 1797, Martha West, formerly Clerck married out. 18 3mo 1801, at Saratoga MM from Galway Prep. 22 4mo 1801, Freeman Clark reinstated. Lydia Clark's request for membership accepted. 14 3mo 1805 at Providence Prep Mtg - Freeman Clark had launched into business beyond his abilities to manage and hath neglected paing his debts and likewise absconded. He was disowned. 4 2mo 1818, Lydia, member in Galway (set off from Saratoga in 1802), requests certificate for herself and two sons Jonathan and Freeman to be directed to West Lake Monthly Meeting. First reference to Freeman in Upper Canada. We are very lucky that the annual census data from 1803 has survived for Newcastle District, [Newcastle District Census, AO, MS16, reels 4 and 5, Hamilton and Haldimand Townships]. See these transcriptions for Hamilton Tp and Haldimand Tp. Freeman Clark shows up as a single male in Hamilton Township in 1805. We can speculate that he came to Canada to escape his debts and problems. The Quaker minutes state that he "absconded." The next year Freeman brings his family to Canada as he has "1 male, 1 female, 3 males under 16, 1 female under 16" living at his residence. He lives in Hamilton Township till 1808. Then in 4mo 1808 Freeman Clark purchases Lot 29, Con A, broken Front in Haldimand Township, just east of Hamilton Tp. This lot is a little west of Grafton on the south side of Hwy 2. See the map below. The Haldimand Township census is very complete and an excellent transcription exists till 1825. The film has been examined for the years after 1825. Note that a John Clark is in Haldimand from 1806 onward and would appear to not be related to Freeman Clark. Freeman is in the census each year with his growing family. Freeman Sr stays on lot 29 north part, Con A till 1833. He dies in 1835. In 1830, Freeman Sr buys lot 31, a clergy reserve lot, from the government. Lydia had not been disowned back in New York in 1805 with her husband, so on 11mo 1818 her request for her membership to be transferred to West Lake is recorded. An Adolphustown minute book states, "Providence Preparative Meeting inform that Lydia Clark had removed with her husband into the verge of West Lake Monthly Meeting in cannada [sic] and requests a certificate for herself and two sons namely Jonathan and Freeman." So Lydia is now a member but she is not mentioned in any of the West Lake minutes until 11mo 1826when she is appointed as an overseer. This implies that she had some prior attendance. Lydia and her husband live in Haldimand Township which is a considerable distance from Bloomfield, Prince edward County, where the West Lake Meeting was centered. Lydia's husband Freeman was still disowned from his NY meeting. He surfaces first in a West Lake book on 6mo 1827 requesting a meeting in Haldimand stating, "The committee to the care of the Meeting at Haldimand reports as follows. We of the committee to the care of the Meeting at Freeman Clark's have attended thereto and did not discover but that it is orderly held and them friends have requested for a Meeting for Worship and a preparative to be held at or near Freeman Clarks the Meeting for worship to be held on first? day and the Preparative Meeting to held on fourth day Preceeding Monthly Meeting week." A Quaker meeting developed in Haldimand and the meetings were first held at Freeman Clark's house and probably under his leadership. Given that Lydia requested membership in 1818 it is possible that a small gathering of like minded Quakers met at Freeman and Lydia's home some years before 1827. Freeman feels he better get officially reinstated as a Quaker and on 3mo 1828, "an acknowledgment was read in this Mtg from Freeman Clark and the tenor of it this Meeting is satisfyed with as he resides within the limits of that Meeting the Clerk is directed to forward a coppy of this Minute and requests friends of that Meeting to take the necessary care in his case and inform him of the result. Signed by direction of the Galway Monthly Meeting [New York State] held 6th of 9th Month 1827. Freeman was accepted as a member at Haldimand but under West Lake the next month. Freeman and Lydia are in the Register as members at Haldimand Mtg. They have sons Freeman Jr, Jonathan and Thomas who are all very active in the Quaker community. They lived near Grafton in Haldimand Township which is 50 miles from Bloomfield where the West Lake meeting was held. West Lake was the monthly meeting and Haldimand Preparative meeting was subordinate to West Lake. This meant that as ministers and overseers, as this family was, they had to travel once a month to the Monthly Meeting in Bloomfield. The obituary for Jonathan in 1835 states that he made this trip; rarely missing a meeting. In 1828 the Quaker community experienced a painful separation into either Orthodox or Hicksite Quakers. West Lake was the site of the superior meeting and it disowned all those who became Hicksite declaring the West Lake meeting house and burial ground in Bloomfield to be Orthodox. The Hicksite Quakers at West Lake built a new meeting house and burial ground in Bloomfield and held the Hicksite Monthly Meetings there. There are two sets of West Lake Minutes for 1828. The Hicksite minutes actually start in 1824 and thus they somehow managed to secure the original minute book. The Orthodox book starts in 1828. The Hicksite book states on 11mo 1828 that "a Complaint against Freeman Clark which is as follows. we have to inform against Freeman Clark for so far deviating from the good order of Society as to interupt our Meeting for Discipline Contrary to order and for bein instrumental in spreading an evil report about a member of our Society which appears not to be true." Freeman is disowned 1mo 1829 and his wife Lydia is disowned for separating on 10mo 1830. Haldimand Prep Meeting was declared a Hicksite meeting with sons Freeman Clark Jr and Jonathan Clark taking the lead. Their parents, Lydia and Freeman Sr, stayed Orthodox and Freeman's name continues in the Orthodox minutes in a prominent role. Their other children also remain Orthodox. The Haldimand Prep minutes tell a painful story. Starting in 2mo 1831 and continuing every month till 12mo, a ruckus is described at each meeting. For example in 6mo, "This meeting being Convened under very trying circumstances on account of those coming among us that have separated from the society of friends and others some of which have been disowned therefor and for other immoral conduct namely Freeman Clark Judah Bowerman Thomas Clark Hyram Betts James Purdy Joseph Beadan? [Beulan?] John Haight Isaac Barton George Kelly John Clark Richard Clark Jonathan Clark of Hallowell and Thomas Simpson they persisting in staying after closing the shutters and being requested to withdraw thereby trespassing on the rights and privileges of our solem meetings after consideration this meeting is united in proceding with the business." Those family members who are orthodox and trying to affect the meeting over these months are: father Freeman Clark, sons Thomas Clark, Richard Clark, Ira Clark, son in law George Kelley. Then there is "Jonathan Clark of Hallowell" who was in good standing at West Lake at that time and subject of section 2 above. The Haldimand Meeting is effectively in control of the two Hicksite sons of Freeman Clark Sr; Jonathan Clark and his brother Freeman Clark Jr. Of course, they disown their father, and brothers Thomas, Richard, Ira and sister Mary. On the flip side, the West Lake Orthodox minutes disown in a reverse manner. On 8mo 1828, Freeman Clark Sr is made Trustee of the property to replace his son Jonathan who was the former Trustee and has separated. In 9mo 1828, the overseers of Haldimand Prep have separated from the Orthodox. Over several months Jonathan and his brother Freeman Clark Jr are disowned and efforts are made to no effect to get them to make an acknowledgment of their ways. They stay Hicksite. The West Lake Orthodox women's minutes record that on 11mo 1828, Elizabeth Clark and Deborah Clark are disowned for separating. These are the wives of Jonathan and Freeman Jr. In late 1828 their sons Freeman Jr and wife Deborah and Jonathan and wife Elizabeth "joined the separatists" and are disowned. Jonathan Clark, son of Freeman Clark, is constantly in the Haldimand Hicksite minutes right up to his death by drowning in October 1835. He was a Hicksite minister and had been appointed to attend the 10mo West Lake Hicksite meeting in Bloomfield. He died in a small canoe between Adolphustown and Stone Mills. The location of the meeting house on lot 29 comes from the 1878 Belden atlas. [Illustrated Historical Atlas Northumberland and Durham, Belden, 1878, reprint, page 52.] Below is a close up of Grafton in Haldimand Township showing lot 29 running from Lake Ontario shore north to the main road. The north half of this lot was owned by Freeman Clark Sr and it shows a church on the lot. There is little doubt that this is the meeting house, though by 1878 it was probably no longer a functioning Quaker meeting house. In 1985, Haldimand Township hired students to work on local history. In the process they heard from some folks about the Quaker Burying Ground on Lot 29. The site was visited and no head stones were visible. One local recalled a stone marker for Mary Hudson last seen in the 1920's. This is from letters in the possession of Ted Dinniwell. In March 2017, Randy Saylor visited the site and no remains of the building were evident. The owners of the property were not home at the time. Read about Quaker burial grounds in Newsletter #33, page 17, of the Canadian Friends Hist Assoc. The Haldimand Preparative Meeting was first established by West Lake in 9mo 1827 to be held "at or near Freeman Clark's." Immediately efforts were made to build a meeting house. At the separation, in the West Lake Orthodox minutes, in 8mo 1828, Freeman Clark [Sr] is named to the committee to be in charge of the property. The next month it is recorded in the minutes that Haldimand has separated! Hardly a year had elapsed since the Haldimand Meeting was established. This Freeman Clark is the father of sons Jonathan and Freeman Jr who have lead the separation. The issue emerges about retrieving some of the expense in building the new meeting house. The West Lake Orthodox Preparative minutes record about 6 months later, on 3mo 1829, that the committee "have produced Freeman Clark’s receipt for 7 dollars and 20 Cents which receipt is directed to Monthly Meeting Our Quoto of Money for Building Haldimand Meeting house is raised." So the meeting house has been built by that time and has been in the hands of the Hicksites. The West Lake Orthodox monthly meeting minutes record that in 2mo 1835 Freeman, "informed this meeting that he had expended a considerable amount towards building Haldimand Meeting house and desired friends to inspect the subject and see if it would not be right to refund some portion of it to him again." Then in 9mo 1835, £20 is refunded to the Estate of the late Freeman Clark, he having died a few months earlier. Freeman Clark Sr writes his will in 1830 naming his wife and children. Freeman dies in April 1835, six months before his son Jonathan drowns in a canoe accident. Clarke, at his residence in Haldimand on Wed the 22nd inst. Mr Freeman Clarke aged 67 years. Mr Clarke was a very respected farmer, a member of the Society of Friends. We believe one of the first settlers in Haldimand. Source: The Reformer Colony, Apr 28 1835. Text from email from Ted Dinniwell. The Haldimand Preparative Meeting was laid down by West Lake in 1842 and this action is the last entry in the Haldimand minute book. However the Orthodox West Lake Monthly meeting minutes tell a bit more. On 9mo 1843, "The half years meeting, unites with the monthly meeting In establishing Haldimand Preparative meeting all of the time at that Place." This shows that the Haldimand Meeting was laid down by the Hicksite meeting but had a rebirth in some fashion as an Orthodox meeting. By 2mo 1847 the same minutes state, "A concern arose in this meeting of the Propriety of appointing a com. to visit Haldimand Preparative meeting on act of the low state of that meeting, and resulted in appointing Thomas Clark Arndi Dorland James Haight Esli Terrel and Gilbert Haight, to visit that meeting in unition with a com. of woman friends, and report thereon." Their report is not in the transcribed minutes. In 10mo of the same year the weekday meetings at Haldimand were discontinued. The Haldimand meeting was in decline. See the 1997 posting titled Clarke, Herbert Stanley on Genuki L archives. Pollina Clark, born US 15 9mo 1797, married between Apr 1814 and Apr 1816 to Rozell Badgley, son of Anthony Badgley. In 1822, Rozell Badgley is in Hamilton Tp with a wife. They lived in Hamilton Twp., Haldimand Twp., Cobourg and Mariposa Twp. William Clark, b. 8 2mo 1800, US., d. 1878 and buried McIndoo's Cemetery, Mariposa Twp, Victoria. Married Mary Kirby, b. 1804, d. 1876, buried McIndoo's Cemetery. Sons William and Jonathan Clark are in Hamilton Tp in 1822 with wives and no children. William Clark is in Hamilton Tp in 1823 with wife and one son. William first appears in the Haldimand census in 1830. He lives on Lots 30 and 31 south part until at least 1838. He lived in Mariposa Twp. from 1837 on. They moved from Hamilton Twp. Jonathan Clark, b. 2 2mo 1802, d. 14 10mo 1835, m. Elizabeth Andrus. Jonathan was made a minister in 6mo 1833. Jonathan Clark farms lot 27 north part, Con A until his death in 1835 and his wife Elizabeth continues as a widow on the property. OBIT: Clark. Another melancholy intelligence has been received of another distressed calamity in the Bay of Quinte whereby an old and most respected settler in the neighbourhood, Mr John Clark of Haldimand has lost his life the week before last while crossing with a boy in a skiff to stone mills near Hallowell. The boat accidentally upset and both unfortuntely perished. We regret to add that Mr Clark has left an affectionate wife with a large and amiable family to lament his untimely end. OBIT: Clark, John. The week before last (on a Sunday evening), John Clark, an old and respectable inhabitant of Haldimand township, was drowned while crossing in a small canoe from Adolphustown to the Stone Mills. He leaves a wife and a large family. Source: (Copied from the Cobourg Star.) The Observer, Cornwall, 30 October, 1835. From Lennox & Addington Hist. Soc. Freeman Clark, b. 18 4mo 1804, NY State, d. 26 Jun 1877. Buried Pine Tree Society of Friends Burial Ground, Norwich, ON. Married 1st Deborah Brock. married 2nd Clarrisa Watson on 17 7mo 1873. She died 18 10mo 1905, aged 87 years, buried Friends Cemetery, Hicksite, Schomberg, King Twp, York County. Freeman Clark Jr submits an acknowledgment for marrying out on 6mo 1824 and the next month it is accepted. In 1825 Freeman Jr (age 21 with a wife) in Haldimand Tp. This entry in the Ameliasburgh minutes dated 11 2mo 1825 is Deborah being accepted at Ameliasburgh. "An overseer hands in a request from Deborah Clark." This makes sense as Haldimand meeting was not yet created so even though she lived in Haldimand she was attending the Ameliasburgh meeting. The West Lake Monthly Meeting records on 21 4mo 1825 "The woman informed this that they were united in accepting Deborah Clark which this Meeting unites with them therein." Freeman Clark Jr remains with the Hicksite Quakers in Haldimand. Deborah was also very active in the Hicksite Women's minutes as an overseer and elder for most years between 1829 and 1837. Freeman Jr farms lot 30 South part, Con A till 1829 when he disappears from the Haldimand Census. The Hicksite Women's minutes show Freeman and Deborah requesting a certificate of removal for Yarmouth Meeting on 1mo 1840. The last entry for Freeman in the Haldimand minutes is 10mo 1839 when he is appointed to attend the Monthly Meeting. In 1842 there is a Freeman W Clark mentioned who is likely a later generation and about whom a complaint has come forward. Thomas Clark, b. 20 2mo 1807 on Front Road west of Covert's Creek. Died 24 May 1893 at home of Calvin Lapp, buried Stanley Burial Ground below Grafton, ON. Calvin Lapp's wife was Lydia Badgley, a daughter of Pollina and Rozell Badgley. Thomas Clark was a witness to the will of Charles H. Lapp. Charles's wife was Jane Badgley another daughter of Pollina and Rozell. He married first Jane Bowerman between 2 3mo 1828 - 17 4mo 1828. She died within the first year. See proposed marriage 1mo 1828. "Jane Bowerman m. Thomas Clark (brother of Dr Clark, Cobourg of Freeman Clark." He married second Elizabeth Kirby in 1830, She was born c1809. Thomas submitted an acknowledgment on 11mo 1830 for marrying out. It was accepted. Son Thomas first appears in Haldimand in 1831 on lot 31 S, Con A and two years later begins farming lot 29 South part, con 1 till 1835. Thomas and Ira acknowledge for marrying out and are accepted back as Orthodox Quakers in 2mo 1831. "The West Lake Boarding School near Wellington, PEC, was built before 1839 and closed in 1865. Thomas Clarke, assisted by his wife, was the first superintendent". Source: Quote taken from a photo of the historical plaque situated at the site of the surviving building. Carm Foster did not find this couple in the 1851 census. He was active as a Quaker minister. He lived in Picton and then moved to Haldimand Twp. in 1847. In 1887 the farm was sold and moved to Cobourg, ON. Ira E[thelbert]Clark, b. 11 9mo 1809 near Cobourg, Haldimand Twp. Died 19 Oct 1884, buried Dunkerron Cemetery. Married c1830 Jane Kirby, b 5 Oct 1811 at Napanee, ON and d 1 Sep 1875, buried Dunkerron Cem. They lived on a farm Con 8, lot 3, West Gwillimbury Twp, Simcoe Co.
On 11mo 1830, Ira submits an acknowledgment for marrying out. It is accepted and he remains Orthodox. Son Ira Clark first appears in 1831 in Haldimand and stays only till 1834 on lot 32 N, Con A. On 4mo 1836 he requests a removal certificate to Yonge St meeting. Mary Eliza Clark, b. 19 2mo 1811, m. George Kelley c1829. They lived Baltimore, ON. George operated a Turner's shop. In the 1861 census he was listed as a chair maker. John R. Clark, b. 25 7mo 1814, d. 1861. Married 14 3mo 1834 to Eunice Huff of Haldimand Twp., dau of Obadiah and Eunice Huff both deceased and adopted dau of Joseph Pearson and Mary. He was Hon Member of Parliament. Richard Clark, born in Haldimand Township, was a descendant of the old settlers of that name. John R. Clark, his father, took an active part in political and local matters, had been selected as the candidate of his party to contest the East Riding of Northumberland, but was suddenly cut off by death before taking the field. Source: Illustrated Historical Atlas Northumberland and Durham, Belden, 1878, reprint, page viii. Richard Hare Clark MD, b. 20 5mo 1816, d. 1890. Married Catherine Wade. Lived Cobourg, ON. He was a widower in the 1861 census. Susannah Van Ness Clark, b. 6 6mo 1817. Died [7 10mo 1846] five days after Richard H. Lapp was born at the home of her brother Dr Richard Lapp [sic] in Cobourg, ON. She was buried on the farm of her brother John R. Clark Hon MP on the Lake Road between Cobourg and Grafton, ON. Married on 17 Nov 1835 to Henry Lapp, b. 22 Aug 1822, d 15 Feb 1894, buried United Church Cem, Baltimore, ON. Henry Lapp was a first cousin of the father of Charles H. Lapp and Calvin Lapp. Henry Lapps father was Jeremiah Lapp. Henry had a sister Julia Lapp (Canfield) who moved to the USA and settled at Redmonds corners, near Clarkson, NY on Ridge Rd West. Source for most of this on a copy of a typed version on letterhead of Mrs Robert S Hammer, Macedon NY and dated by hand 1953. Mrs Hammer was a daughter of Lydia Jane Lapp Rogers. Source: Thanks to Edward (Ted) Dinniwell of Hamilton, ON, for supplying most of the birth, marriage and death information above and lots of other information as well. From the 1812 petition below we learn that this William Clark was born in Nova Scotia about 1788 and came to Hallowell Township around 1806. He was accepted as a Quaker in 2mo 1810 [see these Adolphustown records] and was acknowledged to be a Quaker in the 1812 affirmation below. In all records he resided in Hallowell. It appears that there is no close connection to Jonathan Clark. In his petition for a lease of a clergy reserve there is an affidavit that he was known by S Washburn, ensign of the Prince Edward Militia. It does not say he served but does state that "he has behaved himself to be a good peaceable subject during the late war." Quakers refused military service and the odd wording suggests he did not serve but perhaps supported in other ways. An adult William Clark remains orthodox in 1828 and this is likely the same man. His wife, children and farm have not been identified. The West Lake minutes of 1mo 1839 record a William Clark to be disowned for "neglecting the attendance of our religious meetings and complying with military requisitions." This might be the man above. William Clark does not appear on any of the Prince Edward militia rolls transcribed on this site. 5 May 1825 York, William Clark petitions to have the rent reduced on Block E in Hallowell. He took over the lease of Ebenezer Washburn and it was supposed to be 968 acres but it is only 667 acres. Denied. William and Joseph Clark are both loyalists and they settle in Adolphustown. They are named in the loyalists lists and are part of the Associated Loyalists who assembled in New York City in 1783 and came to Canada. They most likely followed Major Peter Vanalstine to Adolphustown. The reader should have a quick look at the Clark entries in the Adolphustown census data below for each year between 1794 and 1811. William and Joseph are there from day one. Also note that Jonathan Clark is there for only one year in 1799. There is no Jonathan Clark in the loyalist record and none of Joseph or William children of that name petition for a grant. It has already been concluded that this Jonathan is the same man as in section 2 above. Below are a number of records showing the presence of these two families in Adolphustown. William Clark is a resident of Adolphustown from 1794 to 1822. His wife's forename is Lois as recorded in Langhorn's register. Examine the census data over the years and you will see that they had children in 1794. William of Adolphustown ceases to be in the census after 1811 so perhaps he died though his children in their petitions do not refer to him as the "late" William so perhaps he is still alive in 1831. William is granted half of lot 17, con 4, Adolphustown. Joseph's grant has not been found. William and Joseph are brothers. This is confirmed in a petition by Joseph, son of William, who petitions for a grant and the warrant is given to His uncle Joseph." See below. Four of William's children petition successfully for land as children of a loyalist. The petitions are shown below. Mary (b.1789) who marries Belyattee Outwater and petitions in Jan 1807. Joseph (b. 1787) who petitions in Mar 1807. James (b. 1789) petitions in Jan 1816. John petitions in Jul 1831. Dr H.C. Burleigh's Papers are held at Queen's University and are on line. In his folder indexed as "Clark iii" he has three lineages for Williams's family showing his four children. See the first, second and third. The birth years above come from Burleigh's file. So where is Joseph Clark UE living? He is only in the Adolphustown census till 1797 and not shown in the Adolphustown schedule of grants.Possibly he died about 1797 and disappeared from the record. Hezekiah and Elias Clark settled in Adolphustown in 1799 and are in the Adolphustown census data. They live together with large families on lot 23 con 4 a few lots away from William. They petition together in 1811 and this suggests a strong connection, probably brothers. They do not appear in the loyalist lists. William Clark does support them in their petition also suggesting a connection. It is noted that in 1799 William shows 3 men in his household. Could it be that Hezekiah and Elias are the other two men with William? Hezekiah and Elias show up in the Adolphustown census a couple of years later. This would not be unusual where the men come first to check the area out and then return to fetch their families. They both have large families as mentioned in the petition. There is a very good chance that William, Joseph, Hezekiah and Elias are all brothers. We know that William Clark and Joseph Clark are brothers. They travel out of New York as Loyalists. Hezekiah and Elias Clark get support from William Clark so they might all be connected. However there is no suggestion that the Quaker Clarks and Loyalists Clarks are related. It is also concluded that the Jonathan Clark who has single entry in the Adolphustown census in 1799 is not part of this group. Joseph Clark, Adolphustown, Employed on Secret Service, Employed 1776. Joseph Clarke and William Clarke are named, along with 24 others including Thomas and Philip Dorland. Source: Return of Loyalists Embarked on board transports for Canada, PRO WO 60 33 Part II, as quoted in Voyage of a Different Kind, Larry Turner, 1984, Mika, pages 111 and 117. Alexander Clark of the Bay of Quinte, non commissioned officer with Sir John Johnson's Corps has received 550 acres. He is with wife and children. Prays for land for his brother Hugh Clark who arrived from Nova Scotia. Recommends that brother will receive lands on application in person. Joseph Clark son of William Clark, Adolphustown prays for 200 acres as SUE. granted. Warrant given to his Uncle Joseph Clark. Hezekiah Clark and Elias Clarke came to Upper Canada 12 years ago  settled on land owned by Samuel Tuffir a reduced Lieut from a Corps of Rangers and now claimed by James McMasters (lot 23, Con 4, Adolphustown) and allowed. They have large families, 14 and 8 children and pray to stay on the place. Supported on an affidavit by Burger Huyck and William Clark. Recommended that McMasters "ought to be advised to make easy terms with them." John Clark of Sophiasburgh is the son of William Clark a UE Loyalist of Adolphustow, prays for 200 acres as SUE. Recommended. Two petitions by brothers Elias Clark of Ameliasburgh and Peter Clark of Murray. Both sons of Joseph Clark, UE of Adolphustown. Pray for grant SUE. Spencer Hazelton was a significant figure in early Upper Canada [See the Dictionary of Canadian Biography.] In 1792 Hazelton petitioned to settle about 340 individuals from Vermont to Haldimand Township, Northumberland County. He was granted the whole township for this purpose. Below are the Clark names on the three pages of signatures, grouped as written. 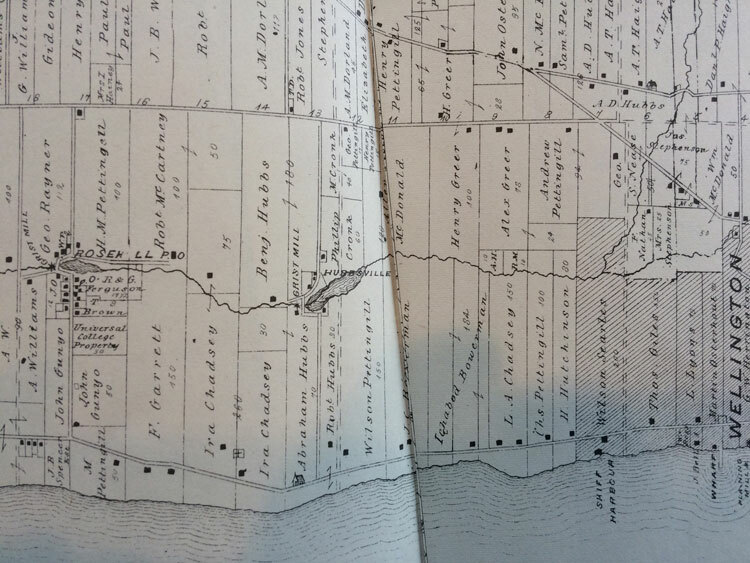 The 1878 Belden Atlas has an historical account for Haldimand Township and relates that some of the earliest settlers were from Vermont. The Vermont surnames in the Atlas are; Ewing, Bradley, Barnum, Doolittle, Clark and Rogers [page viii]. Only Clark and Rogers are surnames on the 1792 petition suggesting that the effort fizzled out. The Rogers name is interesting. The Atlas states that James G. Rogers settled in Haldimand early. He was a grand son of James Rogers, commander of the Kings Rangers. James Rogers lost his land in Vermont after the revolution and settled in Fredericksburgh in 1784. Also a Vermonter named Timothy Rogers was a Quaker at Ferrisburgh, VT and he settled in Upper Canada. Is there a connection to these extended Rogers families? It is probable that few of the people who signed the petition actually came to Haldimand. Perhaps they settled elsewhere. There is probably no connection between the Vermonters and Freeman Clarke and his wife Lydia who settled in Haldimand in 1809. "Minors who remain with friends & under their care. Names and ages at the separation. " "Haldimand Meeting continued. Minors committed with the separatists"
"West Lake preparative meeting. Minors & others who remain with & are the children of friends." "Names, Residence, How disposed of"
Cronkhite William Henry, " , B 24th 12mo 1839. Deceased 4th mo 1st 1861 aged 21.years. Clark Sarah Lydia, 5th 2mo 1860, "
Source: West Lake Register, 1820 - 1882. Register O-9-1. Held at the CYM Quaker Archives in Newmarket. Transcription is on their web site. Possibly also on Ancestry.com. The image numbers are those taken for the archive's transcription as the pages were not numbered. This register commenced in 1820 and upon the separation in 1828 continued in the hands of the Orthodox Quakers. A new list was generated in 1828 and a second one after that. Entries of death or disownment were added later if appropriate. 8. CLARK SNIPPETS FROM VARIOUS QUAKER MINUTE BOOKS. [Removal] To the Monthly Meeting at the Creek … Jonathan Clark has Plased his son Allen as an apprentice in the Verge of your meeting … Certify he is a member of this Meeting … signed by order of the Monthly Meeting held at Nine Partners 18 of 5th. Mo. 1796 … Philip Hoag Clk. Note also Jonathan Clark Jr. Who might have been the son of Jonathan Clark and a brother of Allen Clark was disowned for horse racing. See Allen Clark below for the same thing. Philip Clark and Mary Chase, he from Nine Partners. 1st intention 13 2m 1792; 2nd intention, 12 3mo 1792. 16 4mo 1792 reported accomplished. Allen Clark deviated from plainness attending horse race information from Nine Partners MM. Jonathan Clark wants to make satisfaction. Returning acknowledgment to Mtg. For further consideration. Nine Partners informed Adolphustown PM that they have accepted Jonathan Clark’s acknowledgment. "Said meeting also inform that Jonathan Clark had given way to Passion so far as to misuse and abuse his wife which they refer to this meetings consideration "
Jonathan Clark visited acknowledges his transgression and forwards the acknowledgment to the Mtg. Jonathan Clark acknowledges his misconduct for which he was disowned. Jonathan Clark - committee not ready to report as yet. Jonathan Clark - further under this meeting his acknowledgment accepted and returned as a member. Friends appointed to the care of Jonathan Clark’s case not prepared to report as yet. Stephen Bowerman requests a few lines from this to Yonge St. On account of marriage. William Christy and William Clark to look into his clearness and report. Jonathan Clark a member of a committee agreeing to continue a meeting at Othaniell Elsworth’s residence for 3 months. Also Jonathan Clark added to a committee in the Benjamin Terry Case. The men Friends inform this meeting that Jonathan Clark is released from the station of minister which this meeting unites with. Sarah Clark, on 8 occasions is appointed at attend the Monthly Meeting. From 1809 to 1816 and then again from 1822 to 1824, Sarah Clark is frequently appointed to committees and to attend Monthly Meetings. A complaint against Phillip Clarke for going out Plainness in dress attending a marriage acc. by a priest and suffering himself to be joined in Marriage by a priest to one not a member which is directed to the Monthly Meeting. Stephen Blount and P. E Leavens are app to raise the sum of 6 dollars to complete our proportion of money for Haldemad Meeting house pay it to Freemen Clarke and produce his receipt to next Meeting. Stephen Blount and Peter E. Leavens report they have attended to their appointment and have produced Freeman Clark’s receipt for 7 dollars and 20 Cents which receipt is directed to Monthly Meeting Our Quoto of Money for Building Haldimand Meeting house is raised. The Treasurer has produced Freeman Clarkes receipt for 7 Pounds for Building Haldimand Meeting House which is also directed to the Monthly Meeting. Freeman Clark remains with the Orthodox Quakers and is appointed to the committee to "have the charge and care of all the property belonging to this meeting." The overseers of Haldimand Mtg have separated [and become Hicksite]. Freeman Clarke is appointed as an overseer at Haldimand. William Clarke and Thomas Clarke appointed to committees so they have remained Orthodox. Freeman Clarke [Sr] appointed to attend Half Yearly Meeting and on a committee to report back on all those that have separated. Jonathan Clarke sends an acknowledgment "condemning his outgoings and deviations." Also are United with the Womens Meeting in Accepting the Acknowledgement of Mary E Kelly formerly Clark. Jonathan Clarke appointed to attend Half Yearly Mtg. Freeman Clark informed this meeting that he had expended a considerable amount towards building Haldimand Meeting house and desired friends to inspect the subject and see if it would not be right to refund some portion of it to him again. Twenty pounds to be refunded to the Estate of the late Freeman Clark. Not having received the minutes from Haldimand preparative meeting for some time past this meeting unites in appointing the following friends in conjunction with a committee of Women friends to investigate the state of said Meeting and report at our next meeting /viz/ Moses White Stephen Blunt Haviland Hubbs John Cronkhite Vincent Bowerman and Thomas Clark. Richard Clark is disowned, "he manifested no disposition of appealing." Freeman Clark accepted back into membership. Jonathan Clark and others appointed to meet a number of members who separated. This meeting is united with the women’s meeting in disowning Lydia Clark & Hannah Brock. Ameliasburg preparative Meeting forwarded to this a request signed Deborah Clark signifying her desire of becoming a member amongst us. Accepted. The Friends appointed to forward names to serve in the Station of overseers for the ensuing year have proposed the following names Amy Bowerman Ruth Christy & Catharine White for West Lake. Anna Cronk & Rebecah Stickney for Green Point. Deborah Clark & Elizabeth Clark for Holderman which this Meeting unites with. The Friends appointed to forward names to serve in the Station of overseers for the ensuing year have proposed the following names ... Deborah Clark & Elizabeth Clark for Holderman which this Meeting unites with. The friends appointed to bring forward names to serve in the station of Elders have proposed the following names, Sarah Barker Anna Cronk Amy Bowerman Deborah Clark . "West Lake monthly meeting held the 20th day of the 9th Month 1827 by minute just received from our last half years meeting held at Yonge street the 29th of 8th Month 1827 it appears that meeting is united in establishing a meeting for worship and discipline at or near Freeman Clarks to be called Haldimand Preparative meeting." Jonathan Clark was appointed clerk for one year. Jonathan Clark and Freeman Clark are frequently named in these minutes to serve on committees. Also named are Ira E Clark and Freeman Clark Junr. "This meeting being convened under various trying Circumstances on account of those coming among us that have separated from the society of friends and others namely, Thomas Smith Freeman Clark Hyram Betts Thomas Clark Ira Clark John Clark Richard Clark Esla Tyrrel and others. They persisting in staying among us after being reasoned with and entreated to quietly withdraw and leave us as usual to in a silent capacity to transact the weighty affairs of society. They not complying with our entreaties this meeting after weightily Considering the subject are united believing that it is best to proceed in regular order with the business of this meeting having the unity of the womens meeting therein. William Delong and Freeman Clark are appointed to attend the monthly meeting and report"
"This meeting being convened under the same trying circumstances as our last to witt those coming among us that have separated from the society of friends and been disowned therefrom and others that never were members viz James Purdy Thomas Clark Hyram Betts Ira Clark John Clark and George Kelly after being repeatedly requested to withdraw and leave us in a select capacity to transact the affairs of society they persisting in staying and disturbing our meeting this meeting is united in believing it right to center down in the quiet and endeavor to transact the affairs of society in as good order as possible"
This issue continues in the minutes for six months and the names of those who are ultimately disowned are: James Purdy, Thomas Clark, Ira Clark, John Clark, Richard Clark, Freeman Clark [Senior, since junior continues on committees], Hyram Betts, Joseph Bealar, Judah Bowerman, John Haight, Isaac Barton, George Kelly, Jonathan Clark of Hallowell, Thomas Simpson, Joseph Leavens. Note that Jonathan Clark and Freeman Clark Jr continue with the Haldimand [Hicksite] meeting. Jonathan Clark is continuously appointed to attend the monthly meeting in Bloomfield at the new Hicksite Meeting right up till his death in 10mo 1835. Haldimand Meeting laid down by West Lake MM. Source: Source: Appendix To The Report Of The Ontario Bureau Of Industries 1897, Warwick Bro's & Rutter, Toronto, 1899, Royal Ontario Museum Library, FC3061.A553, The People of Adolphustown, p 27-50. Full transcription posted on this web site. 2. Mr James Croil in his History of the County of Dundas, (1861) states that "the Mr Jonathan Clarke, (or Clark) - mentioned on page 30 of the First Volume of this Documentary History - taught school at the Bay of Quinte (Fredericksburgh) in 1786. In 1788, he came to Matilda, and taught a Common School there for several years. A few of the neighbours assisted in the erection of a school house for him." Mr Clark was a native of Perthshire, Scotland. Source: History of the Province of Ontario (Upper Canada), William Canniff, 1872, page 331. 26 Jan 1831, Adolphustown, Lydia Clark of Hillier is daughter of Jacob Corbman, late of the township of Ameliasburgh, a UE Loyalist ... prays for 200 acres as DUE. Margaret Chase maketh oath that she saw Lydia sign the petition. Granted. Note: at the West Lake Hicksite meeting of 20 10mo 1830, This is reported, "This meeting is united with the women’s meeting in disowning Lydia Clark & Hannah Brock." Could it be that this is the same Lydia, wife of Freeman Clark, who is now not a Quaker and feels free to petition for her grant? Note: This Sarah would be the wife of John Clark who lives in Haldimand and is not part of the Freeman Clark family. 18 Feb 1843, Haldimand, Petition of Sarah Clark, wife of John Clark, Haldimand. She is the daughter of William Simpson late of Cramahe, UE Loyalist and that she has reached the age of 25 and prays for a grant as DUE. signed Sally Clark [sic]. Asks to direct script to her son James Clark in Whitby, Oshawa post office. Approved. Robert Morden and Hester Clark, both of Sophiasburgh, 19 Nov 1834. Witnessed by Samuel Clark, Samuel Goslin. Samuel Clark and Margaret McGuin, both of Sophiasburgh, 21 Nov 1834. Witnessed by Robert Morden, Paul Clark. Adam Short and Rachel Clark, both of Sophiasburgh, 24 Aug 1835. Witnessed by Richard Jones, M. Pool. Benjamin Franklin Lazier and Leonora Clark, 14 Sept 1835. Witnessed by Rufus Sawyer, John A. Lepper. Charles B. Clark and Lucinda S. German, both of Hillier, 12 Oct 1835. Witnessed by George German, Sibel Clark. William Clark, of Hillier, and Nancy Smith, of Sophiasburgh, 18 Jan 1837. Witnessed by Parmenas Sprague, John S. Young. William Clark, of Hallowell, and Esther Ann Flagler, of Hillier 14 March 1837. Witnessed by John Haskins, Robert Clark. Cory S. Bull and Frances Clark, both of Hallowell, 17 Sept 1837. Witnessed by Lyman C. Clark, Elizabeth Davis. James Parks, of Hallowell, and Phebe Clark, of Sophiasburgh, 14 July 1839. Witnessed by Samuel Munro, Henry Werden. John I. Clark and Sarah Masten, both of Hillier, 11 June 1839. Witnessed by Solomon Weeks, Henry Gilbert. Joseph Clark and Phebe Leavens, both of Hallowell, 23 July 1839. Witnessed by John Haskins, William Clark. Ezekiel Clark and Mary Ainsley, both of Hallowell, 1st Aug 1839. Witnessed by Philander M. Clarke, Isaiah Ainsley. David Van Alstine and Lucinda Clark, both of Marysburgh, 24 Dec 1839. Witnessed by Alexander Van Alstine, Andrew Dulmage. Cornelius Smith and Almira Clark, both of Sophiasburgh, 5 Oct 1840. Witnessed by Benanuel Sailsbury, Robert Morden. Henry Redner and Eliza Clark, both of Hillier, 17 October 1841. Witnessed by Benanuel Salisbury, John Redner. William Gibson Clark and Sarah Woodrowe, both of Hallowell, 17 March 1843. Witnessed by Jonathon Clark, John Woodrow. 30 March 1843. Witnessed by Caleb S. Williams, Elizabeth M. Taylor. Benjamin F. Burlingham and Nancy Clark, both of Hallowell, 15 March 1842. Witnessed by William Clark, David Burlingham. 2 May 1842. Witnessed by Hugh Arthur, Joseph Reid. James Wm. Clark and Susanah Sarah Walt, both of Ameliasburgh, 5 Nov 1844. Witnessed by Amos Walt, John C. Pennock. 25 Dec 1844. Witnessed by Joseph Pine, Benjamin Pine. David Jones and Charlotte Clark, both of Sophiasburgh, 4 Oct 1843. Witnessed by Robert Norton, Mary Jones. James Walmsley, of Athol, and Isabel Clark, of Marysburgh, 18 Oct 1843. Witnessed by Nelson Clark, Hannah Minaker. Sheldon Dulmage, of Marysburgh, and Maria Clark, of Athol, 19 March 1844. Witnessed by Nelson Clark, Sarah Clapp.